Pulsair offers wastewater equalization tank mixing system. PH equalization mixers can be designed for any tank, basin or holding tank to ensure that particles remain constantly suspended. The result is greatly reduced polymer or chemical consumption and uniform mixing inside the tank using less energy. 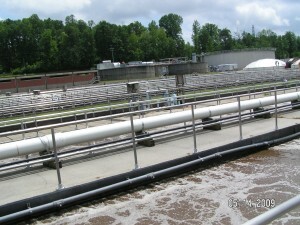 Many industrial wastewater treatment plants include a equalization or neutralization mixing tank to store wastewater in before it is discharged to the local public wastewater treatment facility or to their own de-watering process. Equalization tanks and wet wells exist in industrial, agriculture and municipal wastewater plants to ensure that proper pH balance is achieved prior to the biological stage of the wastewater treatment process. Pulsair pneumatic, large bubble mixing system easily overcome the typical problems in equalization tanks, such as the settling of solids that can cause a significant impact on the biological system. Pulsair also reduces the energy consumption and eliminates the problems associated with large, high torque mechanical mixers typically used for constant mixing. Since there are no moving parts inside the tank with Pulsair mixers, maintenance inside the tank is completely unnecessary. The gaseous atmosphere in these tanks can be potentially explosive, making the maintenance of electric mixers very challenging. Pulsair makes all-pneumatic models that solve the problem because they use no electricity and are inherently safe. Equalization tanks typically remain under constant mixing operation, and Pulsair mixing systems offer unparalleled energy savings without compromising the equalization mixing process. Keeps heavy solids suspended and uniformly mixed in the tank.